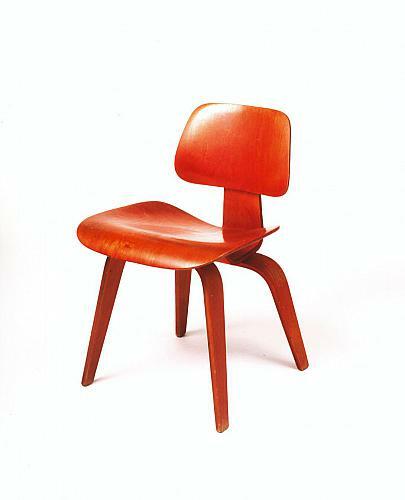 Charles Eames designed the red, molded plywood chair for Herman Miller Inc. The wood finish of the chair is resin impregnated. The seat, back, and legs are molded plywood. The parts of the chair seem to hover in space, aparently independent, but obviously connected. Measurements: 28 ½” high, 19 ½” wide, 20” deep, seat is 18” high. Marilyn and Donald Kooiman donated the chair to the Grand Rapids Public Museum in 1986. The chair was exhibited in the Museum of Modern Art in 1947.